And for more information on this topic, check out our blog post detailing six things to consider when writing product descriptions. Currys gives just four bullet points of information above the fold but provides a hyperlink to more in-depth product details. The product description is well presented using sub-headings and short paragraphs, and the copywriting is also excellent as it uses persuasive writing to upsell the benefits of the device. However it runs to almost 1,200 words so it’s unlikely that anyone will bother to read it all. Next to the full description there is also a summary table that just lists the product spec. This is obviously far easier to digest and I would think that most people would use this part as their main point of reference. Electronics retailer Richer Sounds has such a cluttered product page that it’s hard to digest any of the information – to be honest I’m not even sure if I can buy the product online. There are no product details above the fold other than the standard details and name of the device. The product description itself follows the same bullet point format as Currys but Richer Sounds hasn’t used paragraphs so each section appears as one single bulk of text. This makes it quite difficult to read and isn’t very user-friendly. There is also a ‘Specifications’ tab which summarises the product details in a table format. It includes a useful explanation of what each feature means, so ‘screen size’ is defined as ‘measured diagonally in inches’ and ‘3D TV’ is explained as ‘Does it offer 3D viewing? Remember that glasses are not always included’. This is a nice touch as not everyone is aware of what these terms mean. Department store John Lewis only offers the basic product information above the fold and instead tries to upsell additional services such as installation and disposal of old devices. It’s quite daunting to look at and would benefit from being broken up with additional sub-headings to help the reader locate the information most important to them. The bullets are followed by the product specifications, but rather than opting for a table format John Lewis presents the details in another long, unbroken list. I feel the formatting of both lists could be greatly improved as it’s quite an arduous task for the reader to try and pick out the important information. Department store Sears offers only the basic product description above the fold but includes a hyperlink to more in-depth information further down the page. It has used a bullet point format where each has its own sub-heading to make the information easier to scan and digest – something John Lewis could certainly learn from. Sears also displays the specifications and dimensions in a table alongside the description, however it is squashed into a thin column so some of the information is difficult to read. Best Buy follows the same format as most of the other retailers, with most of the product information appearing beneath the fold. The layout is clean and easy to read, and the copywriters have taken the time try and translate some of the features into language that all shoppers will understand – e.g. ‘Wi-Fi enabled’ becomes ‘Connect to the internet’. Best Buy also improves the overall look of the page by only detailing five of the most important specifications followed by a big, blue call-to-action that links to the complete list. Overall Best Buy has managed to create one of the most user-friendly pages on this list in terms of the design and copywriting. Crampton & Moore is another retailer that doesn’t include any product information at the top of the page, instead opting to promote a five-year warranty and its offer to beat any price on this product. 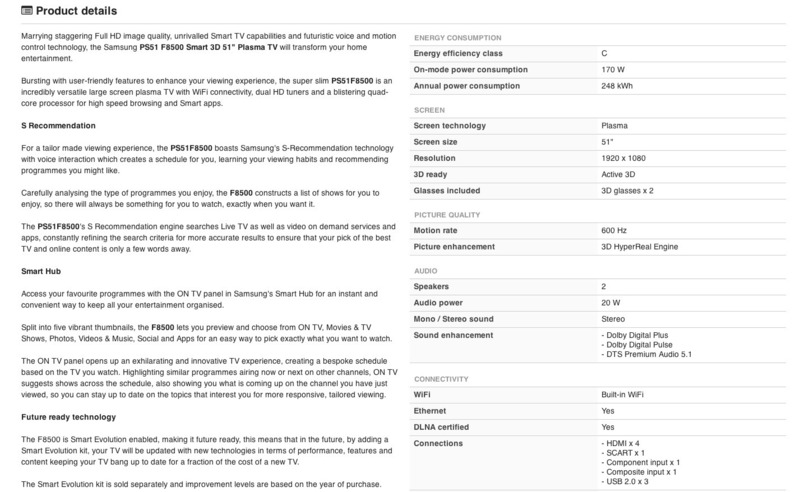 The detailed product information appears lower down the page and begins with a description of Samsung’s new panel technology, which I wouldn’t think is the kind of information that most shoppers are looking for. There are then bullet points for the features and a table that offers a very limited summary of the product specifications. Overall Crampton & Moore offers fairly limited product information for such an expensive and complicated product, so it’s unlikely that consumers would find everything they need in order to make a considered purchase. My last post covering the mechanics that underpin programmatic media provoked some interesting questions.